With all the spinning and dyeing, my crafting activities are getting slower and slower, and it is becoming a rare event that I actually have a finished product to show you. But for once I have been working on something that didn’t take too long to make. The inspiration came from a sustainability workshop I took part in recently. A part of this workshop was a challenge to make a project with things that you already have at home, without buying anything new. This was an ideal opportunity to finally make something from a pile of old jumpers and cardigans that I have been storing for a while. The green jumper was too small to make a decent cushion out of it, so I unravelled it into yarn that I can use to knit something else. 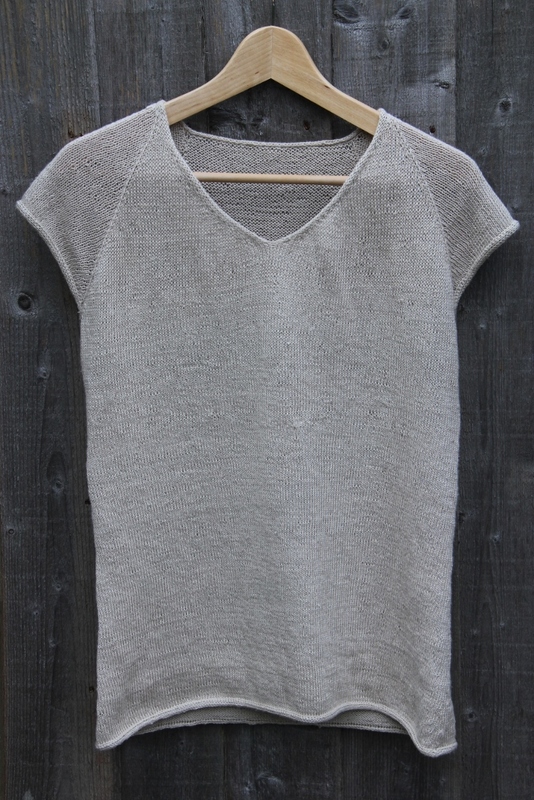 I felted the cardigans by washing them in the washing machine at 60 degrees cotton cycle. The white cardigan had a nice texture so needed no further embellishments, but I decided to embroider the light brown cardigan with some naturally dyed yarns from my stash. 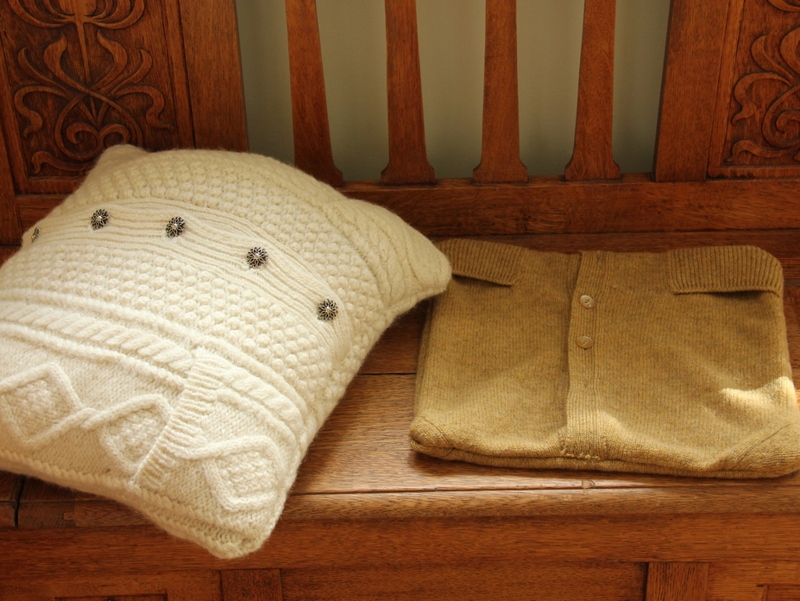 Cardigans turned out to be ideal for making cushions because you can use the button panels at the front of the cardigan to make an opening at the back of the cushion. My cardigans had pockets at the front, which I was too lazy to try to remove, so my cushion covers now have pockets at the back too. 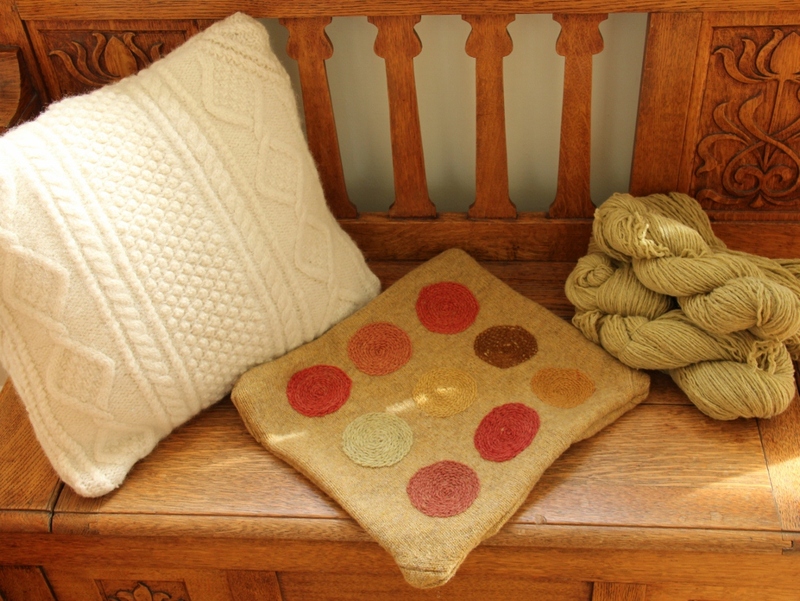 Now I just have to make a small cushion for the brown cushion cover. I really enjoyed making something so quick and easy – it was fun having some instant (well relatively speaking) results for change! Categories: Cushions, Reusing old materials, Sustainable Crafts | Tags: sustainability, sustainable crafts, upcycling old jumpers and cardigans | Permalink. 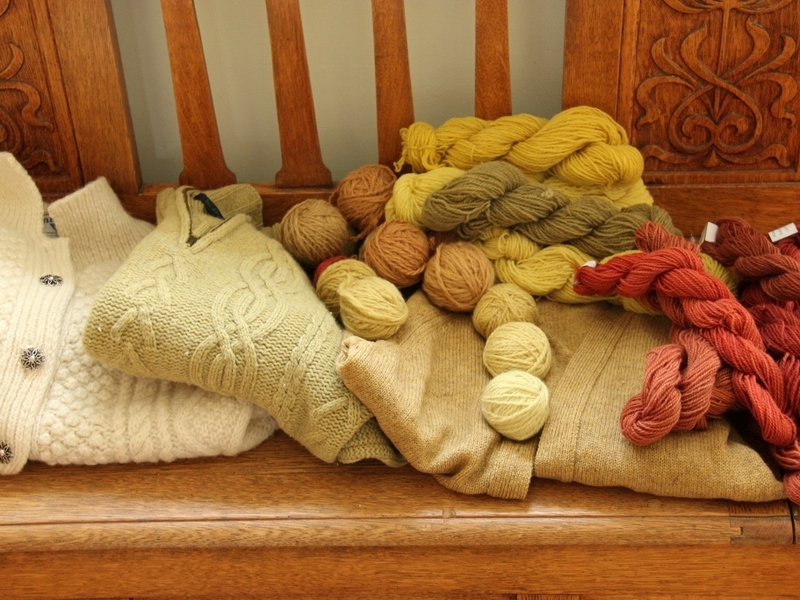 As much as I love the process of natural dyeing, there’s no denying it is a very resource-hungry process. It takes a lot of time, water and energy. First you wash your wool, then you mordant it, cook up the dye liquid and finally dye the wool. At all of these stages, you could potentially heat up a large pot of water to a simmering point and keep it there 30-60 minutes. And there’s all that water you need for rinsing. All this, if you follow the classic dyeing process and “do it properly”, but of course, there are many short cuts you can take without compromising the dyeing results, all of which save some of the precious water and energy. I am very conscious of energy at several levels. Firstly, there’s the environmental aspect. I do not want to use up any more natural resources than it is absolutely necessary. I live in an area that suffers from droughts (even if we have just had the rainiest summer for hundred years…). And electricity, even if you weren’t concerned about environmental things and climate change, costs money. No one wants high electricity bills. And then there’s my own energy, which is an important concern for me personally because of my M.E. The dyeing process is quite strenuous for me so I need to make it as manageable as possible. So I spend a lot of time thinking carefully about the work flow, and take all the short-cuts and labour-saving tricks I can think of. Most of the time it is not manageable for me to do things “properly”: if I run out of energy, the process gets abandoned, often for days or weeks. As I constantly end up breaking the rules of how to do things the right way, I have noticed that the process of natural dyeing is remarkably robust, it is very rare that things get ruined as a result. Saving energy in dyeing often means that the process takes up more time. Mordanting wool is a good example. If you are in a hurry you need to use heat. But heat is by no means necessary. And the extra time it takes means we can get on with something else meanwhile. Constant attention is usually only necessary when you are heating things on a stove. 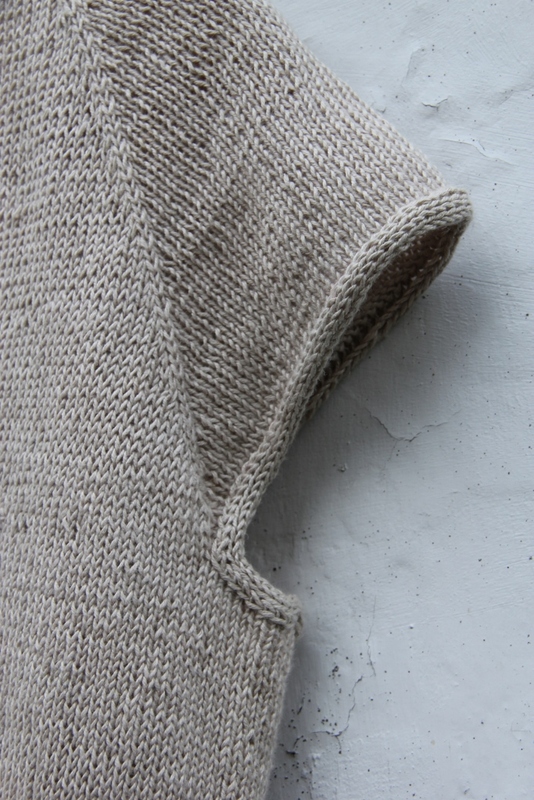 The most popular mordant for wool is alum (aluminium sulphate), typically used with cream of tartar. If you follow the classic mordanting process, you measure your ingredients (8% alum, 7% cream of tartar), mix the powders with some hot water and pour them into a pot of water, add your wool and bring it slowly to simmering point. This, with a large pot full of water, can easily take at least an hour of maximum heat on your stove, and then you need to maintain the temperature for a further 60 minutes. But if you wanted to save a bit of energy, you could switch off the heat once it reaches the simmering point, and leave it to cool overnight. In fact it works just as well if you just mordant your wool in cold mordanting solution and leave it overnight. No heat is necessary, just a bit of extra time. Certainly amongst the dyers in my guild the consensus seems to be that your dyeing results are not compromised in any way by leaving out the heat, the results are just as good. And you can reuse the same bucket of water several times, just adding more mordants every time (some people say you can reduce the amount of mordants if you do this, others say you need to add the whole amount. I’m not sure who is right in this debate, I haven’t done any comparisons myself). So as far as I am concerned, cold mordanting with aluminium sulphate is a definite win-win. But recently I came across a different type of alum that has allowed me to fine-tune the cold mordanting process even further, again saving a bit more labour and hassle. It is called aluminium formate and no heat is necessary when mordanting with it. It is also harmless to aquatic life. It is not well known here in the UK but apparently it is widely used in Germany and that is where I ordered it from. Because of the cost of postage, it was quite expensive to order and that’s the only downside. From an economic point of view it only made sense to buy it in bulk, and then the cost per 100g of mordanted wool was almost identical to the amount I usually pay for aluminium sulphate (although if you can buy your aluminium sulphate in bulk I am sure it would work out cheaper). I worked out that with the current exchange rate the cost was around 12p per 100g of mordant wool. To prepare the mordant, you need a bucket with a lid. You mix a 2% solution by mixing 20g of alum formate for every 1L of water. In other words, the amount of alum formate depends on the amount of water you have in your bucket, not the weight of the wool. My 16l bucket holds 10l of water comfortably, leaving plenty of room for the wool. So to prepare the mordanting solution, I add 8l of cold water in my bucket, dissolve 200g of alum formate in 2l of warm water (which must not be over 50 degrees C) and pour it into the cold water bucket . Once mixed, the solution is ready to go and the single mixing of 200g of aluminium formate to 10l of water will mordant around 2-4 kg of wool over time. You add your wool to the solution and leave it there at least for 2 hours (although you can leave it there indefinitely, so I just add as much wool as the bucket will hold and use it whenever I am ready to dye). When you remove the wool from the bucket, it is important to avoid losing too much of the mordanting solution, so you need to drain the wool properly and add the water back into the bucket. A spin-dryer is ideal, but I haven’t got one (although I am on a look out for a second hand one), so I just drain the wool properly and squeeze it gently to make it as dry as possible. Naturally over time you will lose some water, at which point you top up the water with more 2% solution. When the solution is exhausted you refresh it by adding a new lot of mordant. It is not necessary to rinse the wool at this stage (some people always rinse their fibers after mordanting, but I never do and have never noticed any problems with evenness or strength of colours). If you can organise your dyeing process so that it takes place over a couple of days, I don’t see any downside to mordanting without heat, whether using aluminium sulphate or aluminium formate. With aluminium formate the mordanting process is relatively quick (min 2hrs), so if time is critical then it would be a good option. 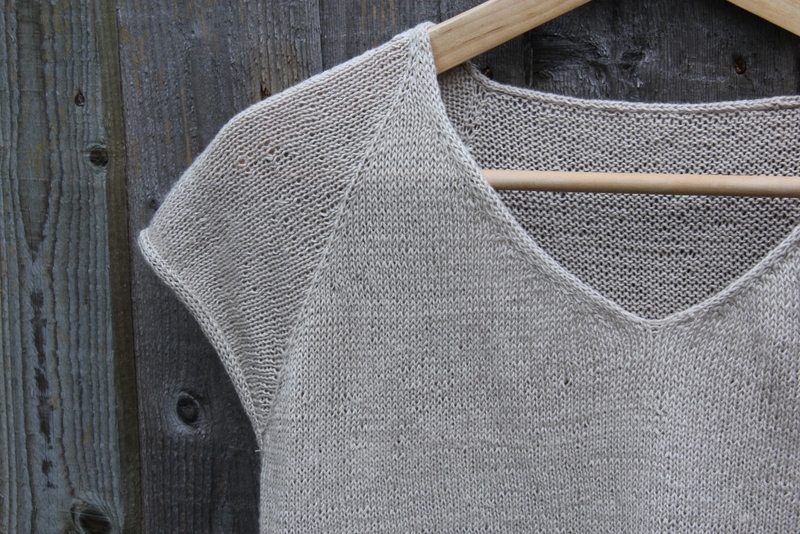 With aluminium formate I particularly like the fact that it is so easy: you measure the ingredients once, after which the bucket is just there to be used for a long time (obviously you do need to keep track of how much wool you have put into it). It is less hassle and takes less time to prepare than mordanting with aluminium sulphate, which you need to measure for every batch of wool you mordant. The downside is that it can be difficult to source and potentially expensive to order, but if you can buy it in bulk then the cost is perfectly acceptable. I haven’t done any direct comparisons between aluminium sulphate and aluminium formate so I do not know how the dyeing results would vary, but I have read that they are comparable. At least for me aluminium formate has worked very well, the colours are just as I would expect them to be. And I use less energy in the process, both my own and the paid sort. It’s a definite win-win. Categories: Dyeing, Sustainable Crafts | Tags: alum, aluminium formate, cold mordanting, natural dyeing, sustainability, sustainable dyeing | Permalink.